This one is another Melissa Original. Tyler and I like to make too much food and freeze it so we can use it on the fly when we don't have time to cook, but want a home cooked meal. Ham for example. Pat brown sugar on the bottom of the crock, place ham on it, rub brown sugar on ham, and cover. Cook on low for 6 hours and BAM! Done and delicious. Well, we wanted ham one night so we pulled some out of the fridge and I thought hmm... I should be able to fancy this up. We now have, Honey Ham Sandwiches. Spray a casserol dish with non-stick and place bottom of buns on the bottom of the dish. Using a basting brush, brush on a little honey mustard on the inside of both the top and bottom of the buns. 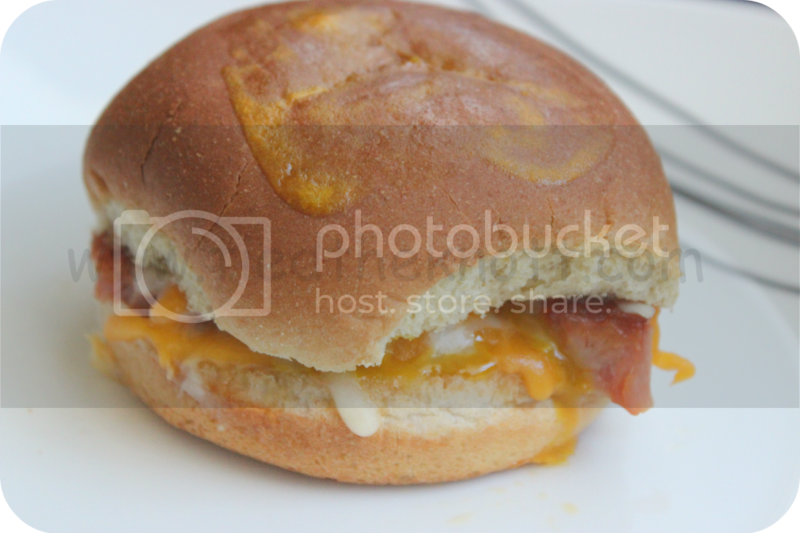 On the bottom layer, place some ham, a sprinkle of cheese, and the top bun. Spread a little honey mustard on the top of the bun top. Place in oven for 15 minutes or until the cheese is melted and the bun looks glazed. This looks so yummy! Pinning it right now! Thanks for sharing!